Eremurus is a sort of perennial grassy plants from a subfamily of Asphodeloideae from the family of Xanthorrhoeaceae, numbering about 60 types. They were known to inhabitants of the Central and Western Asia (in present Afghanistan, Iran, Turkey and adjacent regions). Synonyms "Shiryash" and "Shrysh" — the words meaning, respectively, in Tajik and in Kazakh "glue" because from dry roots of some species of the Desert-candle it is possible "to extract" the powder used for production of medicinal plasters. Young roots are edible (after cooking). All parts of the plants belonging to this sort find application in the course of coloring of products from natural fibers in the yellow color. The semantic background of Latin synonyms of "Ammolirion", "Henningia" and other is represented very foggy. 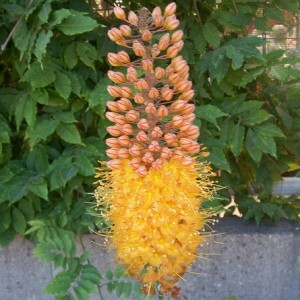 But English names of the Eremurus spectabilis are very expressive: "Foxtail Lily" ( "the Lileyny fox tail"), "Desert Candle" ( "A desert candle"), "King’s Spear" ( "A royal spear") — excellent formulated associations arising at a view of the single naked stalk-tsvetonos which is sticking out of the radical socket of dense linear leaves almost on 2 meters up and bearing the extended cylindrical upright brush (an ear, the sultan) which length exceeds sometimes 1 meter!